There are two words a triathlete does not want to hear the day before a race: riptide warning. Storms came through last night and the lake was literally on a roll. The practice swim was cancelled entirely. There was a sprint tri and a kids tri scheduled for this morning. Those races turned into a 5K and one mile run respectively. 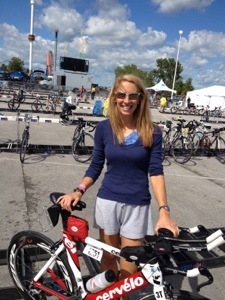 Not only was the swim canceled but due to standing water on the bike course the bike was canceled too. All nerve racking news to read upon waking this morning. Since the practice swim was off I decided to run a bit to loosen up. A friend of mine was driving in this morning and I told her about the changes. She met me at the hotel and ran with me. It was such a good feeling to run with a friend. Without my training partner here it just felt a little off. Having a friend to chat with definitely helped calm my nerves. After our run we changed and headed to the expo. There was an athletes meeting that helped me get a better understanding of what to expect with this weather. If the lake is too rough to swim, the swim will still take place in the bay on the other side of transition. A great advantage for a race to have such a close alternative. If it is in the bay, it will be a time trial start with two athletes at a time going every three to five seconds. I am still concerned about standing water on the bike course. Fortunately the weather cleared up by 10:00 this morning and the puddles should be reduced in size by tomorrow. Wind will also be something to be concerned about, but like so much else it is out of my control. All bikes had to be checked in to transition today too. I made sure all of my race number stickers were on my bike and set it up. 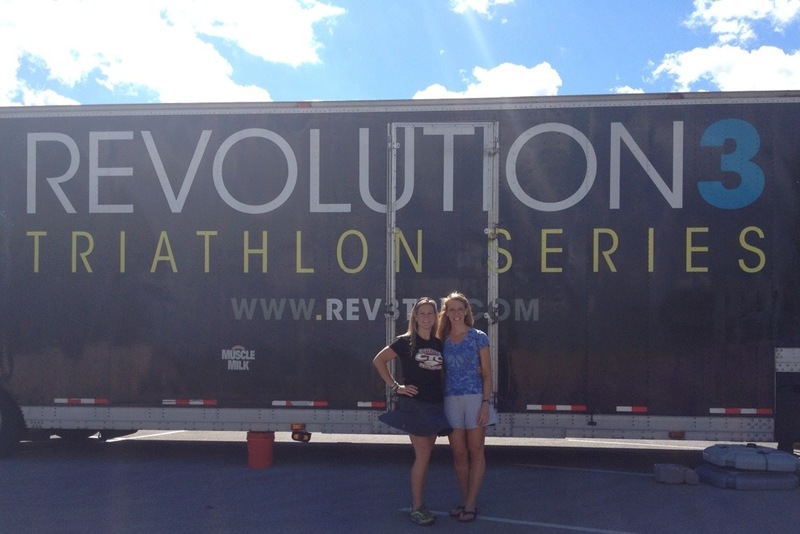 Rev3 does an outstanding job with transition. Volunteers walk you to your assigned space and help you set your bike up. There are no metal racks, instead there are slots with your name and number posted in front. Your bike rear wheel goes in the slot. A great way to set up transition. Here is a picture the volunteer took of me before I set my bike up. To cap off the day we met up with a large group from the Cleveland Triathlon Club for dinner at a local Italian restaurant. I really enjoyed the opportunity to talk with other athletes. Some very seasoned and others competing in their first long course. All with interesting stories of their race experiences. My nerves would come and go, but I was able to bring a calming feeling from the energy of the group. A reminder that even though triathlon is an individual competitor sport, I am not alone in this endeavor. We encourage one another in our own personal successes. And that is a good thing. I am excited with and for you. Can’t wait to hear how it goes! All the best to you today! I’m looking forward to the recap. Wow that would be un-nerving! Hope today went better!! The waters were perfect today! Thank you!